Managing Products in Vend Ecommerce – How can we help? The majority of product management occurs in your main Vend store - this includes adding and editing photos, pricing, name, description, tags, types, and more. These changes will automatically be synchronised to your online store. Whether a product is sold online. What collections each product is part of. The total inventory for each item. If the item has variants, it will show the total inventory for all the items. The product price (exclusive of tax). If this is blank, it means you have variants with different prices. By default, all products will be invisible. Click the toggle on the right-hand side. Use the Select All tick box at the top of the row. Click the arrow next to the number of products selected - you'll see an option to enable products in your web store. 1. Find the product in the list using the search. This searches name, collection, tag, type, and supplier. 2. Tick the box(es) next to the product(s). 3. Click the white drop-down box at the top of the list. 4. Select Add to collection. 5. Choose the collections you would like the product added to. > Hint: If you're adding a product to a sub-collection, we also recommend adding it to the parent collection. This makes it easier for your customers to navigate. You can also add products in bulk. 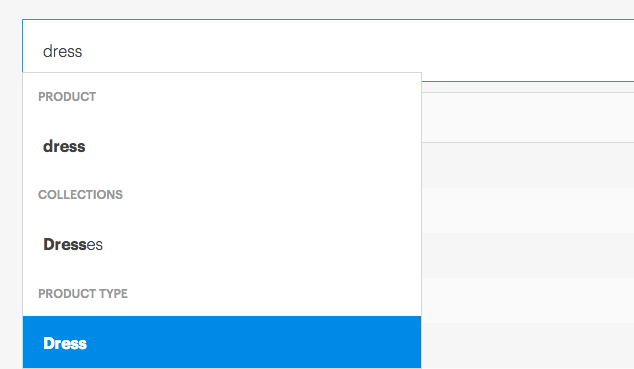 This is particularly handy if you've set up product types and tags, as you can use these to filter your search list. Simply apply the search filter, then use the Select All checkbox at the top of the list to add all the products. Important: If you have more than 50 products that match your filter, you will need to scroll down to ensure they are all showing before you use the Select All box. Otherwise, only the first (visible) 50 will be added. Running sales or discounting a set of products in Ecommerce is set up through your main Vend store, using price books. To set up a Price Book, click the Product tab, and select the Price Book option. Name - In this case, we'll want to call the Price Book something like 'June Ecommerce Sale'. Valid on - Ensure that Ecommerce is ticked and In-Store is unticked. You can have both ticked if you wish to run the sale or discount in your brick and mortar store too. Customer group - This is for in-store sales only, so there is no need to specify this for Ecommerce. If you are running the pricebook in your store also, select a specific customer group or leave it as All Customers. Outlet - This is for in-store sales only, so there is no need to specify this for Ecommerce. If you are running the pricebook in your store also, select the specific outlet you wish you run it for or leave it as All Outlets. Valid from and Valid to - Specify here when you would like the sale to start and end or leave these blank to start the 'discount' immediately and continue it indefinitely. Once this is complete, you can add the products to the Price Book that you want to discount or put on sale in Ecommerce. To learn how to add products to the Price Book check out this article here. After this, you should be set to go! Most Ecommerce themes will automatically be set up to show both the old and new price, so customers can see what a great deal they're getting. How does product syncing work? When you initially create your store, we will sync all your active products in Vend to your Ecommerce store. This includes any photos. Important: If you have variants, your total number of products in Ecommerce will only count 1 product for each variant family. Don't worry if your product number is different to in Vend - this is why. All changes to the products after they've been synced (including inventory, descriptions and photos) will also be synced. What happens when I add products after I've set up my store? Each time you add a new product in Vend, it will automatically be synced to your Ecommerce store. It will appear as enabled, but will not be visible until you add it to a collection. You'll need to open your Ecommerce store and add it to a collection before it's sold online. What happens when I deactivate a product after I've set up my Ecommerce store? The product will be removed from Ecommerce. It will be re-added if you activate it again. What happens when I delete a product after I've set up my Ecommerce store? The product will be removed from Ecommerce.